NASA’s Jet Propulsion Laboratory (JPL) has noted some issues with its Mars Science Laboratory rover Curiosity’s wheels since the one-ton robotic explorer landed on the surface of the Red Planet in August of 2012. To gain a better understanding as to the severity of the damage as well as the potential impact to the rover’s current, extended, mission – Space Safety Magazine-partner SpaceFlight Insider reached out to JPL to get a better understanding of how this damage might impact the Curiosity’s future on Mars. The nuclear-powered rover is a direct descendant from the three rovers that were sent to Mars in the past. Mission planners have been surprised at the level of damage that the wheel’s have sustained in the two years post-landing. JPL’s Jim Erickson, Curiosity’s project manager addressed these concerns in a recent conversation with SFI. In this NASA / JPL image, one of NASA’s Mars Science Laboratory rover Curiosity’s wheels shows clear signs of wear and tear (Credits: NASA JPL-Caltech MSSS). 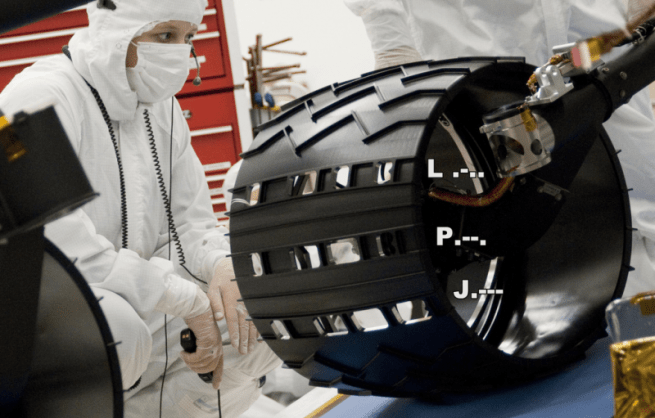 SpaceFlight Insider: Jim, what is the current situation with Curiosity’s wheels? Also, what has JPL done in order to monitor their status? Erickson: Some wear and tear to Curiosity’s six aluminum wheels was anticipated, but the pace of adding new holes in some of the wheels accelerated in late 2013. In response, the project began systematic photographic monitoring of the wheels’ condition and set up a special team to examine the causes of the damage and identify ways to lessen it. Some of the terrain Curiosity has traversed is studded with sharp, embedded rocks. This is different from any terrain seen by earlier Mars surface missions. 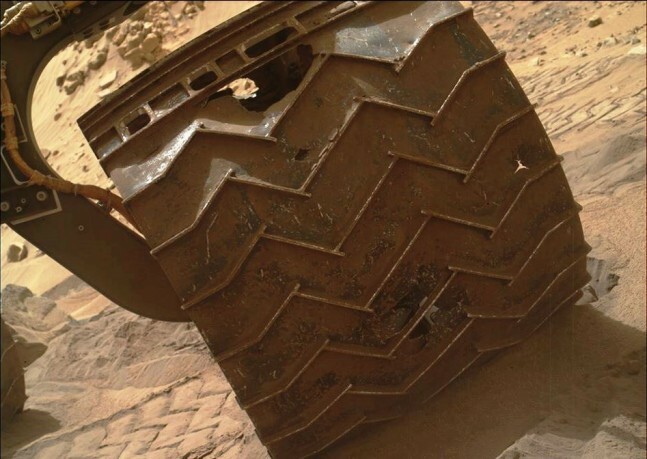 The wheels can bear the rover’s weight without having these rocks poke holes in them, but the mobility system also pushes the front and middle wheels into the rocks with pressure added to the rover’s weight. The damage is to the thin skin of the wheels between the treads (grousers) that provide the wheels’ traction. Much more damage than the amount sustained so far could be tolerated without affecting the rover’s driving capability, but precautions have been adopted to prevent the wheels from being a limiting factor in the mission’s duration and accomplishments. Individual drives are plotted to avoid the sharp rocks where feasible. Longer-distance routes have been re-mapped to favor terrain less damaging to the wheels. Some of the driving is now done in reverse; due to the asymmetry of the rocker-bogie suspension system, this lessens the susceptibility to wheel damage. SpaceFlight Insider: How is the damage dispersed among the wheels and which of them are worse off? Erickson: The rear wheels show little damage. The most damaged of the other four is the left middle wheel. 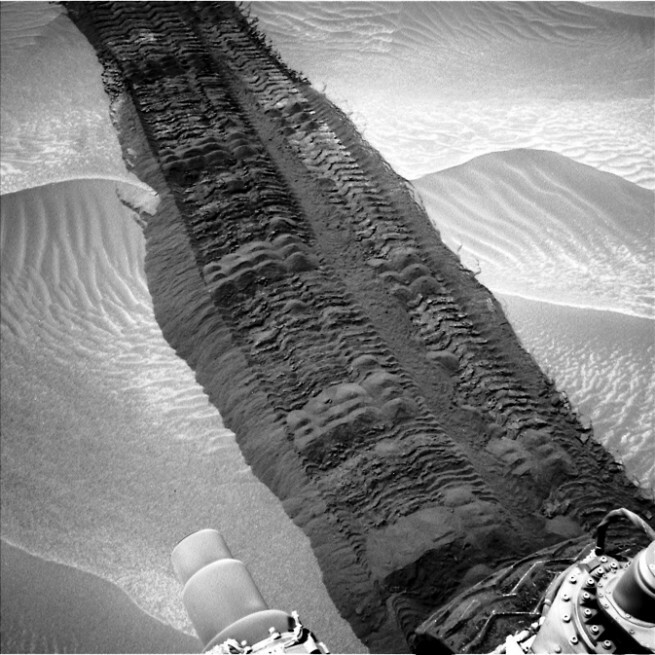 Curiosity’s wheels leave a distinct trail on its way to Mount Sharp (Credits: NASA JPL-Caltech MSSS). SpaceFlight Insider: Who manufactured these wheels? Erickson: The wheels were individually milled out of aluminum blocks by a California-based machine shop to JPL’s design specifications. There is no indication of any shortcoming in the manufacturing of the wheels. Editor’s note: The company that custom-machined the wheels is Tapemation, located in Scotts Valley, Calif.
SpaceFlight Insider: Were the method in which they were manufactured different than with the MER wheels? Erickson: No. Wheels for both MER rovers and MSL were milled from solid aluminum. Curiosity is a much more massive rover than the MER rovers; its wheels are larger, and they also doubled as landing gear, which was not the case for Spirit and Opportunity. SpaceFlight Insider: What does the status of the wheels mean for the mission? Is it in danger due to this damage? Erickson: Added precautions are now taken in planning routes and each day’s drive. Minimizing fresh wheel damage is also a factor in selection of longer-term routes. The mission has invested in some added Earth-based testing of how wheels sustain damage. Some modifications to flight software for the wheel motor controllers are being considered as part of the occasional flight-software upgrades that are a planned process during the mission. One possible change under consideration would allow varying the power to individual wheels during a drive, to counteract the effect of one wheel pushing another into a rock. The “Morse Code” pattern can be seen here. Each of the wheels measures some 50 cm in diameter (Credits: NASA / JPL). SpaceFlight Insider: Was the addition of the “dots and dashes” that spell JPL at all related to this damage? Erickson: No. Those portions of the wheels have sustained less damage than other portions. Curiosity touched down in Mars’ Gale Crater with a mission to see if the Red Planet either now, or some time in its past was ever the home for microbial life. As Erickson mentioned, Curiosity is even larger than the twin MER spacecraft who preceded her. As such, a unique system, the sky crane was employed to safely get the rover to the ground. Having completed its primary mission in 2013, the first of its extended missions is currently underway. As noted, James K. Erickson is project manager for NASA’s Mars Exploration Rovers as well as Mars Science Laboratory. He also served as project manager for NASA’s Galileo mission to Jupiter. He served on Galileo for three years before he joined the MER program in 2001. Erickson has worked at JPL form 30 years at JPL, he has served on a wide array of projects which include the Viking missions to Mars, Voyager’s journeys to the outer planets and beyond as well as the Mars Observer mission. Erickson earned a bachelor’s degree in applied physics from Harvey Mudd College, Claremont, Calif., and a master’s in business administration and project management from West Coast University, Los Angeles. Interview was conducted by The Spaceflight Group’s Jason Rhian. Feature image: Composite image of NASA’s Mars Science Laboratory rover Curiosity’s wheels (Credits: NASA JPL-Caltech MSSS).